This article is about the television show. For the show's setting, see Sesame Street (fictional location). For the comic strip, see Sesame Street (comic strip). Sesame Street is an American educational children's television series that combines live action, sketch comedy, animation and puppetry. It is produced by Sesame Workshop (known as the Children's Television Workshop (CTW) until June 2000) and was created by Joan Ganz Cooney and Lloyd Morrisett. The program is known for its images communicated through the use of Jim Henson's Muppets, and includes short films, with humor and cultural references. The series premiered on November 10, 1969, to positive reviews, some controversy, and high viewership; it has aired on the U.S.'s national public television provider PBS since its debut, with its first run moving to premium channel HBO on January 16, 2016. The format of Sesame Street consists of a combination of commercial television production elements and techniques which have evolved to reflect the changes in American culture and the audience's viewing habits. With the creation of Sesame Street, producers and writers of a children's television show used, for the first time, educational goals and a curriculum to shape its content. It was also the first time a show's educational effects were formally studied. The show, therefore, has undergone significant changes in its history as adjustments to the format and content have been made to reflect change sources to the curriculum. Shortly after creating Sesame Street, its producers developed what came to be called the "CTW model" (after the production company's previous name), a system of television show planning, production, and evaluation based on collaborations between producers, writers, educators, and researchers. The show was initially funded by government and private foundations but has become somewhat self-supporting due to revenues from licensing arrangements, international sales, and other media. By 2006, there were independently produced versions, or "co-productions", of Sesame Street broadcast in twenty countries. In 2001, there were over 120 million viewers of various international versions of Sesame Street, and by the show's 40th anniversary in 2009, it was broadcast in more than 140 countries. Sesame Street was by then the fifteenth-highest-rated children's television show in the United States. A 1996 survey found that 95% of all American preschoolers had watched the show by the time they were three years old. In 2018, it was estimated that 86 million Americans had watched the series as children. As of 2018, Sesame Street has won 189 Emmy Awards and 11 Grammy Awards, more than any other children's show. Sesame Street was conceived in 1966 during discussions between television producer Joan Ganz Cooney and Carnegie Foundation vice president Lloyd Morrisett. Their goal was to create a children's television show that would "master the addictive qualities of television and do something good with them", such as helping young children prepare for school. After two years of research, the newly formed Children's Television Workshop (CTW) received a combined grant of US$8 million ($55 million in 2018 dollars) from the Carnegie Foundation, the Ford Foundation, the Corporation for Public Broadcasting and the U.S. Federal Government to create and produce a new children's television show. The program premiered on public television stations on November 10, 1969. It was the first preschool educational television program to base its contents and production values on laboratory and formative research. Initial responses to the show included adulatory reviews, some controversy, and high ratings. By its 50th anniversary in 2019, there were over 150 versions of Sesame Street, produced in 70 languages. As of 2006, 20 international versions had been produced. "I've always said of our original team that developed and produced Sesame Street: Collectively, we were a genius." According to writer Michael Davis, by the mid-1970s Sesame Street the show had become "an American institution". The cast and crew expanded during this time, with emphasis on the hiring of women crew members and the addition of minorities to the cast. The show's success continued into the 1980s. In 1981, when the federal government withdrew its funding, CTW turned to, and expanded, other revenue sources, including its magazine division, book royalties, product licensing, and foreign broadcast income. Sesame Street's curriculum has expanded to include more affective topics such as relationships, ethics, and emotions. Many of the show's storylines were taken from the experiences of its writing staff, cast, and crew, most notably, the 1982 death of Will Lee—who played Mr. Hooper—and the marriage of Luis and Maria in 1988. By the end of the 1990s, Sesame Street faced societal and economic challenges, including changes in viewing habits of young children, competition from other shows, the development of cable television, and a drop in ratings. After the turn of the 21st century, Sesame Street made major structural changes. For example, starting in 2002, its format became more narrative and included ongoing storylines. After its thirtieth anniversary in 1999, due to the popularity of the Muppet Elmo the show also incorporated a popular segment known as "Elmo's World". Upon its fortieth anniversary in 2009, the show received a Lifetime Achievement Emmy at the 36th Daytime Emmy Awards. On August 13, 2015, as part of a five-year programming and development deal, Sesame Workshop announced that first-run episodes of Sesame Street would move to premium television service HBO beginning with season 46, which premiered on January 16, 2016. HBO holds first-run rights to all newer episodes of the series, after which they will air on PBS member stations following a nine-month exclusivity window, with no charge to the stations. The agreement also gives HBO exclusive rights to stream past and future Sesame Street episodes on HBO Go and HBO Now, assuming those rights from Amazon Video and Netflix. On August 14 Sesame Workshop announced that it would phase out its in-house subscription streaming service, Sesame Go, as a standalone service, remaining in operation, likely with its offerings reduced to a slate content available free of charge or serving as a portal for Sesame Street's website. The deal came in the wake of cutbacks that had affected the series in recent years, the changing viewer habits of American children in the previous ten years, and Sesame Workshop's dependence upon revenue from DVD sales. In April 2017, Sesame Street introduced Julia, a new Muppet who has autism, performed by Stacey Gordon, who has a son on the autism spectrum. As of the show's 50th anniversary in 2019, Sesame Street has produced over 4,500 episodes, 35 TV specials, 200 home videos, and 180 albums. Its YouTube channel had almost 5 million subscribers. From its first episode, Sesame Street has structured its format by using "a strong visual style, fast-moving action, humor, and music," as well as animation and live-action short films. When Sesame Street premiered, most researchers believed that young children did not have long attention spans, therefore the new show's producers were concerned that an hour-long show would not hold their audience's attention. At first, the show's "street scenes"—the action taking place on its set—consisted of character-driven interactions and were not written as ongoing stories. Instead, they consisted of individual, curriculum-based segments which were interrupted by "inserts" consisting of puppet sketches, short films, and animations. This structure allowed the producers to use a mixture of styles and characters, and to vary the show's pace. By season 20, research had shown that children were able to follow a story, and the street scenes, while still interspersed with other segments, became evolving storylines. "We basically deconstructed the show. It's not a magazine format anymore. It's more like the Sesame hour. Children will be able to navigate through it easier." Upon recommendations by child psychologists, the producers initially decided that the show's human actors and Muppets would not interact because they were concerned it would confuse young children. When the CTW tested the appeal of the new show, they found that although children paid attention to the shows during the Muppet segments, their interest was lost during the "Street" segments. 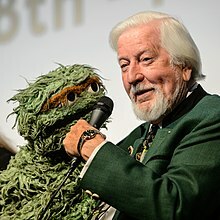 The producers requested that Henson and his team create Muppets such as Big Bird and Oscar the Grouch to interact with the human actors, and the Street segments were re-shot. Sesame Street's format remained intact until the 2000s, when the changing audience required that producers move to a more narrative format. In 1998, the popular "Elmo's World", a 15-minute-long segment hosted by the Muppet Elmo, was created. Starting in 2014, during the show's 45th season, the producers introduced a half-hour version of the program. The new version, which originally complemented the full-hour series, and was both broadcast weekday afternoons and streamed on the Internet. The half-hour version of the show became the standard with the 46th season. Author Malcolm Gladwell said that "Sesame Street was built around a single, breakthrough insight: that if you can hold the attention of children, you can educate them". Gerald S. Lesser, the CTW's first advisory board chair, went even further, saying that the effective use of television as an educational tool needed to capture, focus, and sustain children's attention. Sesame Street was the first children's show to structure each episode, and the segments within them, to capture children's attention, and to make, as Gladwell put it, "small but critical adjustments" to keep it. According to CTW researchers Rosemarie Truglio and Shalom Fisch, Sesame Street was one of the few children's television programs to utilize a detailed and comprehensive educational curriculum, garnered from formative and summative research. After Sesame Street's first season, its critics forced its producers and researchers to address more overtly such affective goals as social competence, tolerance of diversity, and nonaggressive ways of resolving conflict. These issues were addressed through interpersonal disputes among its Street characters. During the 1980s, the show incorporated the real-life experiences of the show's cast and crew, including the death of Will Lee (Mr. Hooper) and the pregnancy of Sonia Manzano (Maria) to address affective concerns. In later seasons, Sesame Street addressed real-life disasters such as the September 11 terrorist attacks and Hurricane Katrina. The show's goals for outreach were addressed through a series of programs that first focused on promotion and then, after the first season, on the development of educational materials used in preschool settings. Innovative programs were developed because their target audience, children and their families in low-income, inner-city homes, did not traditionally watch educational programs on television and because traditional methods of promotion and advertising were not effective with these groups. As a result of Cooney's initial proposal in 1968, the Carnegie Institute awarded her an $1 million grant to create a new children's television program and establish the CTW, renamed in June 2000 to Sesame Workshop (SW). Cooney and Morrisett procured additional multimillion-dollar grants from the U.S. federal government, The Arthur Vining Davis Foundations, CPB, and the Ford Foundation. Davis reported that Cooney and Morrisett decided that if they did not procure full funding from the beginning, they would drop the idea of producing the show. As Lesser reported, funds gained from a combination of government agencies and private foundations protected them from the economic pressures experienced by commercial broadcast television networks, but created challenges in procuring future funding. After Sesame Street's initial success, its producers began to think about its survival beyond its development and first season and decided to explore other funding sources. From the first season, they understood that the source of their funding, which they considered "seed" money, would need to be replaced. The 1970s were marked by conflicts between the CTW and the federal government; in 1978, the U.S. Department of Education refused to deliver a $2 million check until the last day of CTW's fiscal year. As a result, the CTW decided to depend upon licensing arrangements with toy companies and other manufacturers, publishing, and international sales for their funding. In 1998, the CTW accepted corporate sponsorship to raise funds for Sesame Street and other projects. For the first time, they allowed short advertisements by indoor playground manufacturer Discovery Zone, their first corporate sponsor, to air before and after each episode. Consumer advocate Ralph Nader, who had previously appeared on Sesame Street, called for a boycott of the show, saying that the CTW was "exploiting impressionable children". While first-run episodes on HBO do not have underwriting due to its status as a pay-TV network, repeats on PBS continue to have corporate underwriting. Producer Joan Ganz Cooney has stated, "Without research, there would be no Sesame Street". In 1967, when Cooney and her team began to plan the show's development, combining research with television production was, as she put it, "positively heretical". Shortly after creating Sesame Street, its producers began to develop what came to be called "the CTW model", a system of planning, production, and evaluation that did not fully emerge until the end of the show's first season. [note 3] According to Morrow, the CTW model consisted of four parts: "the interaction of receptive television producers and child science experts, the creation of a specific and age-appropriate curriculum, research to shape the program directly, and independent measurement of viewers' learning". Cooney credited the show's high standard in research procedures to Harvard professors Gerald S. Lesser, whom the CTW hired to design the show's educational objectives, and Edward L. Palmer, who was responsible for conducting the show's formative research and for bridging the gap between the show's producers and researchers. The CTW conducted research in two ways: in-house formative research that informed and improved production, and independent summative evaluations, conducted by the Educational Testing Service (ETS) during the show's first two seasons, which measuring its educational effectiveness. Cooney stated, "From the beginning, we—the planners of the project—designed the show as an experimental research project with educational advisers, researchers, and television producers collaborating as equal partners". Cooney also described the collaboration as an "arranged marriage". Sesame Street has used many writers in its long history. As Dave Connell, one of Sesame Street's original producers, has stated, it was difficult to find adults who could identify a preschooler's interest level. Fifteen writers a year worked on the show's scripts, but very few lasted longer than one season. Norman Stiles, head writer in 1987, reported that most writers would "burn out" after writing about a dozen scripts. According to Gikow, Sesame Street went against the convention of hiring teachers to write for the show, as most educational television programs did at the time. Instead, Cooney and the producers felt that it would be easier to teach writers how to interpret curriculum than to teach educators how to write comedy. As Stone stated, "Writing for children is not so easy". Long-time writer Tony Geiss agreed, stating in 2009, "It's not an easy show to write. You have to know the characters and the format and how to teach and be funny at the same time, which is a big, ambidextrous stunt". The Kaufman Astoria Studios, where Sesame Street is taped. The show's research team developed an annotated document, or "Writer's Notebook", which served as a bridge between the show's curriculum goals and script development. The notebook was a compilation of programming ideas designed to teach specific curriculum points, provided extended definitions of curriculum goals, and assisted the writers and producers in translating the goals into televised material. Suggestions in the notebook were free of references to specific characters and contexts on the show so that they could be implemented as openly and flexibly as possible. Early in their history Sesame Street and the CTW began to look for alternative funding sources and turned to creating products and writing licensing agreements. They became, as Cooney put it, "a multiple-media institution". In 1970, the CTW created a "non-broadcast" division responsible for creating and publishing books and Sesame Street Magazine. By 2019, the Sesame Workshop had published over 6,500 book titles. The Workshop decided from the start that all materials their licensing program created would "underscore and amplify" the show's curriculum. In 2004, over 68% of Sesame Street's revenue came from licenses and products such as toys and clothing. By 2008, the Sesame Street Muppets accounted for between $15 million and $17 million per year in licensing and merchandising fees, split between the Sesame Workshop and The Jim Henson Company. By 2019, the Sesame Workshop had over 500 licensing agreements and had produced over 200 hours of home video. There have been two theatrically-released Sesame Street movies, Follow That Bird, released in 1985, and Elmo in Grouchland, released in 1999. In early 2019, it was announced that a third film, a musical co-starring Anne Hathaway and written and directed by Jonathan Krisel, would be produced. Director Jon Stone, talking about the music of Sesame Street, said: "There was no other sound like it on television". For the first time in children's television, the show's songs fulfilled a specific purpose and supported its curriculum. In order to attract the best composers and lyricists, the CTW allowed songwriters like Sesame Street's first musical director Joe Raposo to retain the rights to the songs they wrote, which earned them lucrative profits and helped the show sustain public interest. By 2019, there were 180 albums of Sesame Street music produced, and its songwriters had received 11 Grammys. Sesame Street used animations and short films commissioned from outside studios, interspersed throughout each episode, to help teach their viewers basic concepts like numbers and letters. Jim Henson was one of the many producers to create short films for the show. Shortly after Sesame Street debuted in the United States, the CTW was approached independently by producers from several countries to produce versions of the show at home. These versions came to be called "co-productions". By 2001 there were over 120 million viewers of all international versions of Sesame Street, and in 2006, there were twenty co-productions around the world. By its 50th anniversary in 2019, 190 million children viewed over 160 versions of Sesame Street in 60 languages. In 2005, Doreen Carvajal of The New York Times reported that income from the co-productions and international licensing accounted for $96 million. Shortly after the CTW was created in 1968, Joan Ganz Cooney was named its first executive director. She was one of the first female executives in American television. Her appointment was called "one of the most important television developments of the decade". She assembled a team of producers, all of whom had previously worked on Captain Kangaroo. Jon Stone was responsible for writing, casting, and format; Dave Connell took over animation; and Sam Gibbon served as the show's chief liaison between the production staff and the research team. Cameraman Frankie Biondo worked on Sesame Street from its first episode. Jim Henson and the Muppets' involvement in Sesame Street began when he and Cooney met at one of the curriculum planning seminars in Boston. Author Christopher Finch reported that Stone, who had worked with Henson previously, felt that if they could not bring him on board, they should "make do without puppets". Henson was initially reluctant, but he agreed to join Sesame Street to meet his own social goals. He also agreed to waive his performance fee for full ownership of the Sesame Street Muppets and to split any revenue they generated with the CTW. As Morrow stated, Henson's puppets were a crucial part of the show's popularity and it brought Henson national attention. Davis reported that Henson was able to take "arcane academic goals" and translate them to "effective and pleasurable viewing". In early research, the Muppet segments of the show scored high, and more Muppets were added during the first few seasons. Morrow reported that the Muppets were effective teaching tools because children easily recognized them, they were stereotypical and predictable, and they appealed to adults and older siblings. "Sesame Street is best known for the creative geniuses it attracted, people like Jim Henson and Joe Raposo and Frank Oz, who intuitively grasped what it takes to get through to children. They were television's answer to Beatrix Potter or L. Frank Baum or Dr. Seuss." Although the producers decided against depending upon a single host for Sesame Street, instead casting a group of ethnically diverse actors, they realized that a children's television program needed to have, as Lesser put it, "a variety of distinctive and reliable personalities", both human and Muppet. Jon Stone, whose goal was to cast white actors in the minority, was responsible for hiring the show's first cast. He did not audition actors until Spring 1969, a few weeks before the five test shows were due to be filmed. Stone videotaped the auditions, and Ed Palmer took them out into the field to test children's reactions. The actors who received the "most enthusiastic thumbs up" were cast. For example, Loretta Long was chosen to play Susan when the children who saw her audition stood up and sang along with her rendition of "I'm a Little Teapot". As Stone said, casting was the only aspect of the show that was "just completely haphazard". Most of the cast and crew found jobs on Sesame Street through personal relationships with Stone and the other producers. According to puppeteer Marty Robinson in 2019, longevity was common among the show's cast and crew. According to the CTW's research, children preferred watching and listening to other children more than to puppets and adults, so they included children in many scenes. Dave Connell insisted that no child actors be used, so these children were non-professionals, unscripted, and spontaneous. Many of their reactions were unpredictable and difficult to control, but the adult cast learned to handle the children's spontaneity flexibly, even when it resulted in departures from the planned script or lesson. CTW research also revealed that the children's hesitations and on-air mistakes served as models for viewers. According to Morrow, this resulted in the show having a "fresh quality", especially in its early years. Children were also used in the voice-over commentaries of most of the live-action films the CTW produced. When Sesame Street premiered in 1969, it aired on only 67.6% of American televisions, but it earned a 3.3 Nielsen rating, which totaled 1.9 million households. By the show's tenth anniversary in 1979, nine million American children under the age of 6 were watching Sesame Street daily. According to a 1993 survey conducted by the U.S. Department of Education, out of the show's 6.6 million viewers, 2.4 million kindergartners regularly watched it. 77% of preschoolers watched it once a week, and 86% of kindergartners and first- and second-grade students had watched it once a week before starting school. The show reached most young children in almost all demographic groups. The show's ratings significantly decreased in the early 1990s, due to changes in children's viewing habits and in the television marketplace. The producers responded by making large-scale structural changes to the show. By 2006, Sesame Street had become "the most widely viewed children's television show in the world", with 20 international independent versions and broadcasts in over 120 countries. A 1996 survey found that 95% of all American preschoolers had watched the show by the time they were three years old. In 2008, it was estimated that 77 million Americans had watched the series as children. By the show's 40th anniversary in 2009, it was ranked the fifteenth-most-popular children's show on television, and by its 50th anniversary in 2019, the show had 100% brand awareness globally. In 2018, the show was the second-highest-rated program on PBS Kids. "Sesame Street [is] perhaps the most vigorously researched, vetted, and fretted-over program on the planet. It would take a fork-lift to now to haul away the load of scholarly paper devoted to the series..."
Lesser believed that Sesame Street research "may have conferred a new respectability upon the studies of the effects of visual media upon children". He also believed that the show had the same effect on the prestige of producing shows for children in the television industry. Historian Robert Morrow, in his book Sesame Street and the Reform of Children's Television, which chronicled the show's influence on children's television and on the television industry as a whole, reported that many critics of commercial television saw Sesame Street as a "straightforward illustration for reform". Les Brown, a writer for Variety, saw in Sesame Street "a hope for a more substantial future" for television. Morrow reported that the networks responded by creating more high-quality television programs, but that many critics saw them as "appeasement gestures". According to Morrow, despite the CTW Model's effectiveness in creating a popular show, commercial television "made only a limited effort to emulate CTW's methods", and did not use a curriculum or evaluate what children learned from them. By the mid-1970s commercial television had abandoned their experiments with creating better children's programming. Other critics hoped that Sesame Street, with its depiction of a functioning, multicultural community, would nurture racial tolerance in its young viewers. It was not until the mid-1990s that another children's television educational program, Blue's Clues, used the CTW's methods to create and modify their content. The creators of Blue's Clues were influenced by Sesame Street, but wanted to use research conducted in the 30 years since its debut. Angela Santomero, one of its producers, said, "We wanted to learn from Sesame Street and take it one step further". Critic Richard Roeper said that perhaps one of the strongest indicators of the influence of Sesame Street has been the enduring rumors and urban legends surrounding the show and its characters, especially those concerning Bert and Ernie. One popular rumor points to Bert and Ernie being gay, as revealed by Mark Saltzman, one of the show's writers. In response, Sesame Street firmly denies the allegation. Sesame Street was praised from its debut in 1969. Newsday reported that several newspapers and magazines had written "glowing" reports about the CTW and Cooney. The press overwhelmingly praised the new show; several popular magazines and niche magazines lauded it. In 1970, Sesame Street won twenty awards, including a Peabody Award, three Emmys, an award from the Public Relations Society of America, a Clio, and a Prix Jeunesse. By 1995, the show had won two Peabody Awards and four Parents' Choice Awards. In addition, it was the subject of retrospectives at the Smithsonian Institution and the Museum of Modern Art. "Sesame Street is...with lapses, the most intelligent and important program in television. That is not anything much yet." Sesame Street was not without its detractors, however. The state commission in Mississippi, where Henson was from, operated the state's PBS member station; in May 1970 it voted to not air Sesame Street because of its "highly [racially] integrated cast of children" which "the commission members felt ... Mississippi was not yet ready for". According to Children and Television, Lesser's account of the development and early years of Sesame Street, there was little criticism of the show in the months following its premiere, but it increased at the end of its first season and beginning of the second season. [note 8] Historian Robert W. Morrow speculated that much of the early criticism, which he called "surprisingly intense", stemmed from cultural and historical reasons in regards to, as he put it, "the place of children in American society and the controversies about television's effects on them". According to Morrow, the "most important" studies finding negative effects of Sesame Street were conducted by educator Herbert A. Sprigle and psychologist Thomas D. Cook during its first two seasons. Social scientist and Head Start founder Urie Bronfenbrenner criticized the show for being too wholesome. Psychologist Leon Eisenberg saw Sesame Street's urban setting as "superficial" and having little to do with the problems confronted by the inner-city child. Head Start director Edward Zigler was probably Sesame Street's most vocal critic in the show's early years. In spite of their commitment to multiculturalism, the CTW experienced conflicts with the leadership of minority groups, especially Latino groups and feminists, who objected to Sesame Street's depiction of Latinos and women. The CTW took steps to address their objections. By 1971, the CTW hired Hispanic actors, production staff, and researchers, and by the mid-1970s, Morrow reported that "the show included Chicano and Puerto Rican cast members, films about Mexican holidays and foods, and cartoons that taught Spanish words". As The New York Times has stated, creating strong female characters "that make kids laugh, but not...as female stereotypes" has been a challenge for the producers of Sesame Street. According to Morrow, change regarding how women and girls were depicted on Sesame Street occurred slowly. As more female Muppets performers like Camille Bonora, Fran Brill, Pam Arciero, Carmen Osbahr, Stephanie D'Abruzzo, Jennifer Barnhart, and Leslie Carrara-Rudolph were hired and trained, stronger female characters like Rosita and Abby Cadabby were created. In 2002, Sesame Street was ranked No. 27 on TV Guide's 50 Greatest TV Shows of All Time. It also won another Peabody Award in 2009 for sesamestreet.org. In 2013, TV Guide ranked the series No. 30 on its list of the 60 Best Series. As of 2018, Sesame Street has received 189 Emmy Awards, more than any other television series. ^ Season 44 (2013–2014) was the first time episodes were numbered in a seasonal order rather than the numerical and chronological fashion used since the show premiered. For example, episode 4401 means "the first episode of the 44th season", not "the 4401st episode" (it is in fact the 4328th episode). ^ By 2019, 80% of parents watched Sesame Street with their children, and 650 celebrities had appeared on the show. ^ See Gikow, p. 155, for a visual representation of the CTW model. ^ Most of the first season was filmed at a studio near Broadway, but a strike forced their move to Teletape Studios. In the early days, the set was simple, consisting of four structures (Gikow, pp. 66–67). In 1982, Sesame Street began filming at Unitel Studios on 57th Street, but relocated to Kaufman Astoria Studios in 1993, when the producers decided they needed more space (Gikow, pp. 206–207). ^ According to Parade Magazine in 2019, 1 million children played with Sesame Street toys daily. ^ According to Edward Palmer and his colleague Shalom M. Fisch, these studies were responsible for securing funding for the show over the next several years. ^ See Gikow, pp. 284–285; "G" Is for Growing: Thirty Years of Research on Children and Sesame Street, pp. 147–230. ^ See Lesser, pp. 175–201 for his response to the early critics of Sesame Street. ^ a b Brooke, Jill (November 13, 1998). "'Sesame Street' Takes a Bow to 30 Animated Years". The New York Times. Retrieved March 11, 2019. ^ a b c d e f Guthrie, Marisa (February 6, 2019). "50 Years of Sunny Days on 'Sesame Street': Behind the Scenes of TV's Most Influential Show Ever". The Hollywood Reporter. Retrieved March 11, 2019. ^ a b c Friedman, Michael Jay (April 8, 2006). "Sesame Street Educates and Entertains Internationally" (PDF). America.gov. U.S. Department of State Bureau of International Information Programs. Archived from the original (PDF) on August 15, 2007. Retrieved March 11, 2019. ^ a b c d Hellman, Peter (November 23, 1987). "Street Smart: How Big Bird & Company Do It". New York Magazine. 20 (46): 52. ISSN 0028-7369. Retrieved March 12, 2019. ^ Goodman, Tim (February 4, 2002). "Word on the 'Street'". San Francisco Chronicle. Retrieved October 9, 2008. ^ 36th Daytime Emmy Awards. The CW. ^ Wagmeister, Elizabeth (November 25, 2015). "HBO Sets January Premiere Date for 'Sesame Street,' Introduces New Character". Variety. Retrieved March 11, 2019. ^ Frank Pallotta; Brian Stelter (August 13, 2015). "'Sesame Street' is heading to HBO". CNN Money. Time Warner. Retrieved August 13, 2015. ^ Brian Fung (August 14, 2015). "Sesame Street is killing off its subscription streaming service, Sesame Go". The Washington Post. Graham Media Group. Retrieved August 15, 2015. ^ "'Sesame Street' to Air First on HBO for Next 5 Seasons". The New York Times. The New York Times Company. August 13, 2015. Retrieved August 13, 2015. ^ Brian Steinberg (August 13, 2015). "HBO Picks Up 'Sesame Street' As Kids' Viewing Habits Change". Variety. Penske Media Corporation. Retrieved August 14, 2015. ^ "Sesame Street welcomes Julia, a muppet with autism". BBC News. March 20, 2017. ^ a b c d e f Wallace, Debra (February 6, 2019). "Big Bird Has 4,000 Feathers: 21 Fun Facts About Sesame Street That Will Blow Your Mind". Parade. Retrieved April 11, 2019. ^ Goodman, Tim (February 4, 2002). "Word on the 'Street': Classic Children's Show to Undergo Structural Changes This Season". San Francisco Chronicle. Retrieved May 25, 2011. ^ Dockterman, Eliana (June 18, 2014). "We're Getting a Half-Hour Version of Sesame Street". Time Magazine. Retrieved February 13, 2015. ^ a b Hymowitz, Kay S. (Autumn 1995). "On Sesame Street, It's All Show". City Journal. New York. Retrieved December 18, 2008. ^ "Joan Ganz Cooney". Sesameworkshop.org. ^ Murphy, Tim (November 1, 2009). "How We Got to 'Sesame Street'". New York Magazine. Retrieved August 23, 2011. ^ "How to Get to 'Sesame Street' at the Apollo Theater". New York City Mayor's Office. November 19, 2008. Retrieved August 7, 2009. ^ Spinney, Caroll; Jason Milligan (2003). The Wisdom of Big Bird (and the Dark Genius of Oscar the Grouch): Lessons from a Life in Feathers. New York: Random House. p. 3. ISBN 0-375-50781-7. ^ a b Carvajal, Doreen (December 12, 2005). "Sesame Street Goes Global: Let's All Count the Revenue". The New York Times. Retrieved June 10, 2009. ^ See Gikow, pp. 280–285 for a list of many of the show's products. ^ Kit, Borys; Sandberg, Bryn Elise (February 6, 2019). "'Sesame Street' Movie's Writer-Director Reveals Plot Details". The Hollywood Reporter. Retrieved April 18, 2019. ^ Knowlton, Linda Goldstein and Linda Hawkins Costigan (producers) (2006). The World According to Sesame Street (documentary). Participant Productions. ^ a b "Leaving the neighborhood: 'Sesame Street' muppets to travel across America next year". Retrieved April 21, 2019. ^ a b Seligsohn, Leo. (February 9, 1970). "Backstage at Sesame Street". New York Newsday. Quoted in Davis, p. 197. ^ Zill, Nicholas (2001). "Does Sesame Street Enhance School Readiness? Evidence from a National Survey of Children". "G" is for Growing: Thirty Years of Research on Children and Sesame Street. Mahweh, New Jersey: Lawrence Erlbaum Publishers. pp. 117–120. ISBN 0-8058-3395-1. ^ Weiss, Joanna (October 19, 2005). "New Character Joins PBS". The Boston Globe. Retrieved July 6, 2009. ^ Guernsey, Lisa (May 23, 2009). "'Sesame Street': The Show That Counts". Newsweek. Retrieved August 18, 2009. ^ Roeper, Richard (2001). Hollywood Urban Legends: The Truth Behind All Those Delightfully Persistent Myths of Film, Television and Music. Franklin Lakes, New Jersey: Career Press. pp. 48–53. ISBN 1-56414-554-9. ^ "Bert and Ernie are gay says writer - but Sesame Street insist they're just 'non-sexual puppets'". The Sun. September 18, 2018. Retrieved September 19, 2018. ^ "Bert and Ernie sexuality debate rages". BBC News. September 18, 2018. Retrieved September 19, 2018. ^ Pengelly, Martin (September 18, 2018). "Sesame Street disputes writer's claim that Bert and Ernie are gay". the Guardian. Retrieved September 19, 2018. ^ Pulliam-Moore, Charles. "Sesame Street Wants Us to Believe Bert and Ernie Aren't Gay". io9. Retrieved September 19, 2018. ^ Kanfer, Stefan (November 23, 1970). "Who's Afraid of Big, Bad TV?". Time. Retrieved March 6, 2009. ^ Olivera, Monica (September 20, 2013). "Carmen Osbahr, the talented puppeteer behind Sesame Street's "Rosita"". NBC Universal. Retrieved January 11, 2019. ^ "TV Guide Names Top 50 Shows". CBS News. Associated Press. February 11, 2009. Retrieved June 19, 2011. ^ "TV Guide Magazine's 60 Best Series of All Time". December 23, 2013. ^ DeMara, Bruce (July 28, 2016). "Sesame Street tells veteran cast to hit the road". Toronto Star. Retrieved September 26, 2016. ^ DeMara, Bruce (February 6, 2019). "Big Bird Has 4,000 Feathers: 21 Fun Facts About Sesame Street That Will Blow Your Mind". Parade. Retrieved February 6, 2019. Cooney, Joan Ganz, "Foreword", pp. xi–xiv. Palmer, Edward and Shalom M. Fisch, "The Beginnings of Sesame Street Research", pp. 3–24. Fisch, Shalom M. and Lewis Bernstein, "Formative Research Revealed: Methodological and Process Issues in Formative Research", pp. 39–60. Mielke, Keith W., "A Review of Research on the Educational and Social Impact of Sesame Street", pp. 83–97. Cole, Charlotte F., Beth A. Richman, and Susan A. McCann Brown, "The World of Sesame Street Research", pp. 147–180. This page was last edited on 22 April 2019, at 02:29 (UTC).